This Lowel TotaLED Daylight LED 1-Light Kit put together by B&H includes one TotaLED Daylight LED light and an air-cushioned light stand. The TotaLED floodlight features a 750W tungsten equivalent, upholding the brightness standard of the original Tota light. It has 160 5600K LEDs, a large heatsink with fanless design to keep the light cool, a 100° beam angle, a V-mount battery plate, a built-in yoke, features 100-0% stepless dimming, weighs less than 5 lb, and comes with a carry case. 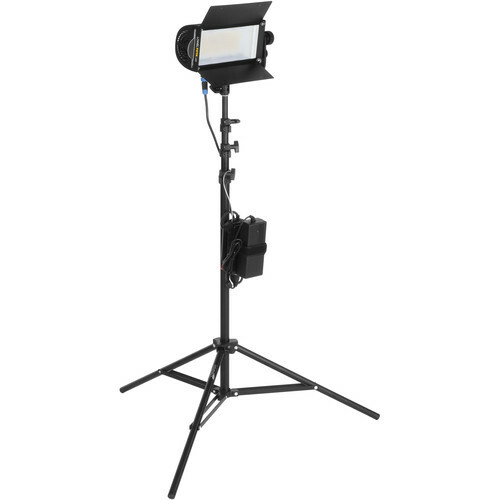 The included 4-section light stand supports up to 8.5 lb and extends to a maximum height of 121.5". See below for more information about the items in this kit.